Thank your lucky stars that you found these free baby shower ideas! There are all sorts of great Star themed party ideas here. A Baby is Coming, the Time is Nigh! How We Wonder Who You Are! 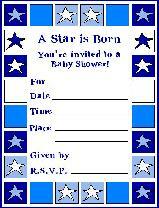 "A Star is Born" is a perfect baby shower theme and a fun theme for the nursery too! There is no better way to describe a little baby than My Shining Star, The Light of My Life, and The Twinkle in My Eye! 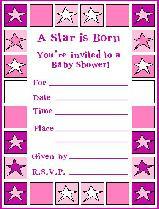 There are so many possibilities for star-themed baby shower invitations. With your creativity and these helpful free baby shower ideas, your invitations will turn out PERFECT! How is vellum used? First, go to a scrapbook or craft store and buy some sheets of star-themed paper (there are all types and styles of star printed paper). You can get at least 2 invitations from one 8 ½ by 11 inch sheet (depending on how big or small you make the invitations). A 4” by 6” invitations is a recommended size. Also, at the store, buy the same amount of sheets of vellum. Also buy some ribbon or star shaped brads. You can use either the ribbon or brads to fasten the vellum to the paper. is not yet in sight. Next, cut your star themed paper to 4” by 6” size. Then place the vellum on top of the star-themed paper and fasten it at the top with two star shaped brads, equally spaced in the center. Or punch two holes, equally spaced (about 1-2 inches apart) in the vellum and the paper; then loop come ribbon through both the paper and the vellum. 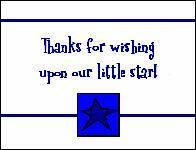 • Candy bars with the wrappers saying: Thanks for wishing upon our little star! • A free movie rental certificate, with a note saying: Thanks for attending the Premiere for our little Star! These free baby shower ideas for decorations are easy to do and easy on your pocketbook! Start out your decorating by buying some helium-filled silver balloons at a craft store. Also get some blue, pink or yellow balloons. There are also Mylar star-shaped balloons you could get. Scatter them throughout the party room to make it resemble a star-lit sky. Sprinkle the gift table, the serving area and/or the game table with star shaped confetti. You could paint several wooden stars (found at your local craft store) and hang them from your ceiling or walls. Paint them silver or white, or cover them with aluminum foil. For your food area, you can have a star patterned table cloth. Star themed plates, napkins, and cups are also a fun "touch" that you add to your baby shower decorations. No matter what the theme is, you can never go wrong with diapers, onesies, wash cloths, and more diapers. Click here for more free baby shower ideas for gifts! • Star Diaper Cake – follow these free baby shower ideas & directions on how to make a diaper cake . Then garnish the diaper cake on top with several classy star shaped ornaments or decorations. • A Star-Studded Clothesline - get a clothesline and secure it somewhere in the party room (in a place where it won't be right in the middle where everyone has to get by it). Use clothespins to pin up a little pair of baby shoes, a little onesie, a painted wooden star, a baby sock, a baby dress (or pants), and another star or two. This is a really simple yet absolutely adorable centerpiece! • A beautiful star centerpiece – Buy a large wooden star at a craft store and paint it a light yellow (or baby blue or pink) and then paint the baby’s name on it, using a creative font stencil. Preparation for this free baby shower game: Before the shower, make a list of 10-15 different lines from various nursery rhymes. It is best if they are not the most recognized line from the rhyme. Use this free printable Nursery Rhyme game card if you would like. Make a copy for each guest. How to play this free baby shower game: During the shower, hand each guest a pen and a copy of the list. They must write down the name of the nursery rhyme for each line on the list. The guest who gets the most correct is the Nursery Rhyme Champion! Preparation for this Baby Shower Game: Buy a baby magazine or two and cut out different pictures of baby bodies. Also buy a magazine or two which features pictures of stars & celebrities. Choose movie stars, sports stars, music stars - find ones that not everyone knows. Cut out celebrity faces and on cardstock glue baby bodies and adhere star faces/heads to the baby bodies. Number each cardstock page. On a computer make a numbered answer sheet with blanks for the guests to write down their answers. Print an answer sheet for each guest. How to Play this Baby Shower Game: Give each guest an answer sheet and pen. Pass the cardstock pages around the room. Instruct the guests to quickly study the pictures and write down who they think the star/celebrity on their numbered answer sheet. The guest who knew the most "stars" wins a prize! Preparation for Baby Shower Bingo: Before the Baby Shower, print off these Star Baby Shower Bingo cards. There are 20 different cards to print off, each one is a different order (so that each guest gets a differently ordered card - otherwise everyone would win at the same time!) Print off a different Bingo card for each guest. Buy Hershey's Kisses or little plastic babies at a craft store for the game pieces (or M&M's, Hershey's minis, or other candy). You will need about 15-20 game pieces for each guest. Also, print off one extra card and cut out each of the squares. You will put these squares into a hat so you can draw them out and read them during the game. You had better buy one or two star-shaped cookie cutters, 'cause you're going to need them! These are some tasty and free baby shower ideas! - Chicken salad sandwiches on a crescent moon croissant. Now it's time for those cookie cutters! Cookie: Cream together butter and sugar. Add eggs and beat well. Add sour cream and vanilla. Add dry ingredients. Roll on floured surface to 1/2 inch thickness. Use a star-shaped cookie cutter. Place on buttered cookie sheet about 2 inches apart. Bake at 350 degrees for 10 minutes, or until very lightly brown. Cookies should be large, soft, and thick. Makes 2 dozen cookies. Mix well with a beater until smooth. You may need to add a little milk to get to the desired consistency, but it should not be runny. Add blue or pink or yellow food coloring for baby colors. - Also, use your cookie cutter to make JELLO jigglers for snacks. In a bowl, combine the cantaloupe, honeydew, and kiwi. Add somewhat-thawed juice concentrate; toss to coat. Refrigerate for at least 2 hours, stirring occasionally. Serve with a slotted spoon. You could cut the fruit into star and moon shapes with special cutters. Makes 6 to 8 servings. - Sparkling apple cider or white grape juice might be fun and everyone can see the twinkle in that! Buy star-shaped ice cube trays and serve up the drinks with star-struck ice cubes. Or serve water with half-moon slices of fresh lemon. Here are two free printable baby shower thank you cards to help you thank your guests for coming! tips on hosting the perfect baby shower ! Let me know what you think of these free baby shower ideas! Or do you have any other Star Baby Shower ideas to add?